The mighty Missouri River borders the eastern edge of the Cheyenne River Reservation, and the rugged Cheyenne River forms its southern boundaries. The stark, solitary beauty of the prairie is breath taking. In some places, you can drive for miles with only nature and wildlife as company. Cheyenne River Reservation is known for its buffalo herd of more than 900 that roams the plains. The Lakota (Sioux) acquired horses around 1740 and arrived on what is now the Cheyenne River Reservation in 1775. They depended on the buffalo for food, shelter and clothing. 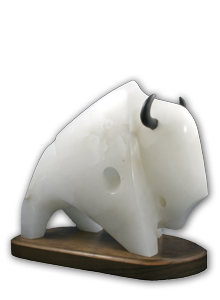 Buffalo hold great spiritual significance for the Dakota, Lakota and Nakota people and are treated with the greatest respect. Today, the Cheyenne River Reservation is located in the two organized counties of Dewey and Ziebach and is comprised of over 2.8 million acres, similar in size to the state of Connecticut. The tribal headquarters is located in Eagle Butte, South Dakota and an 18-member Tribal Council including three executives, govern the tribe. Primary and general elections are held every two and four years and coincide with the US National Election cycle.